Chelsea forward, Eden Hazard says he believes Gonzalo Higuain will fill the huge void left by Diego Costa at Chelsea. He also expressed belief that Higuain will ensure that The Blues are a major force for the rest of the season. Hazard, who starred for Chelsea in their EFL Cup semi-final win over Tottenham last night, said he can’t wait to play with the Argentina international striker. “I like to play with top, top players. At Chelsea I was able to play with one of the best in Costa for three years. I think Higuain is one of the best at the moment. “He has scored a lot of goals. When you see his career he has done it everywhere, Real Madrid, Napoli and Juventus. I think he can do the same here. “This season we have been playing good but we missed the guy to score just one goal. We have had a few games where we have played well and in the end we finished with zero goals, even though we created chances. “It was like that against Spurs. If we had a striker that could score three goals, the game would have finished 5-1. But that hasn’t been the case. Higuain can do that. He is a top scorer, he can score anywhere. “Have we missed a striker like Costa since he left? Yes of course. I like playing with Giroud and Morata, but when Olivier is playing he is doing his best for the side, he is more of a team player than a striker that just scores goals. “Diego was sometimes not the kind of player to play a one-two with, but in the box he was amazing. He just scores one goal, we won and you have the three points. That’s what we need. “I think Higuaín is this kind of player, he can also link with the winger with the midfield, and he can also be the proper striker. Can he make a big impact for the rest of the season? Yes, I hope so,” Goal.com quoted him as saying. The post PREMIER LEAGUE! 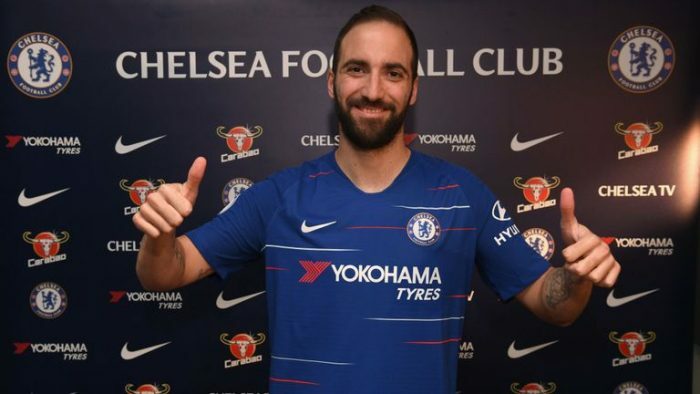 See What Hazard Is Saying About Higuain’s Arrival At Chelsea appeared first on Naijaloaded | Nigeria's Most Visited Music & Entertainment Website.